Grammy's Attic: On Top of the World ! Congrats on the new DT! Fantastic!!! Love your fun and colorful card Connie. Cute image too! The lacy bow tops it off. Very cute image and color selection. Congratulations on being a DT! Thank you for sharing your creation with us @ Incy Wincy Designs Phone Case Inspiration Challenge. Good luck!-Maria Giselle B. Wonderful colours and a wonderful happy image - so a happy card, love the layers. This is delightful, love the sweet image and your colouring is gorgeous. Super cute image and I love all those scallops. 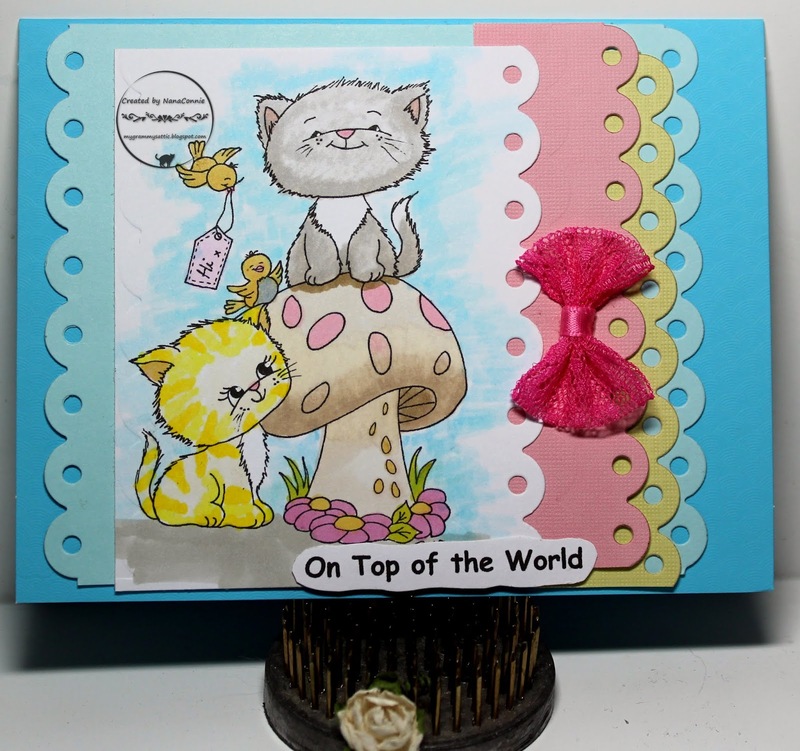 Super cute card and I love your colouring. Congratulations on your new DT position. Cute image! I love the layers and colours. Thanks for joining the Creative Moments Challenge. Beautiful creation! I love design and sweet image! Love the kitties and that adorable mushroom! Great coloring! Thanks for joining us at the Scrapy Land Challenges! Beautiful card Connie, love the kitties and colors! Thank you for sharing with us over at Scrapy Land! Hope to see you again! Awww!! The image is so adorable!! Thank you so much for sharing your fabulous creation with us at Lemon Shortbread Challenge Blog! Cute!!!! Thanks so much for participating in our LEMON SHORTBREAD challenge. Hope you participate in our next challenge!! Have a happy crafty day!! !